Almost identical to its real steel counterpart this full-metal 1911, this flat black Swiss Arms SA 1911 gives you a real steel feel of one of the most iconic American handguns. Load up a single 12g CO2 cartridge and send its 18rds downrange at speeds up to 320 fps. 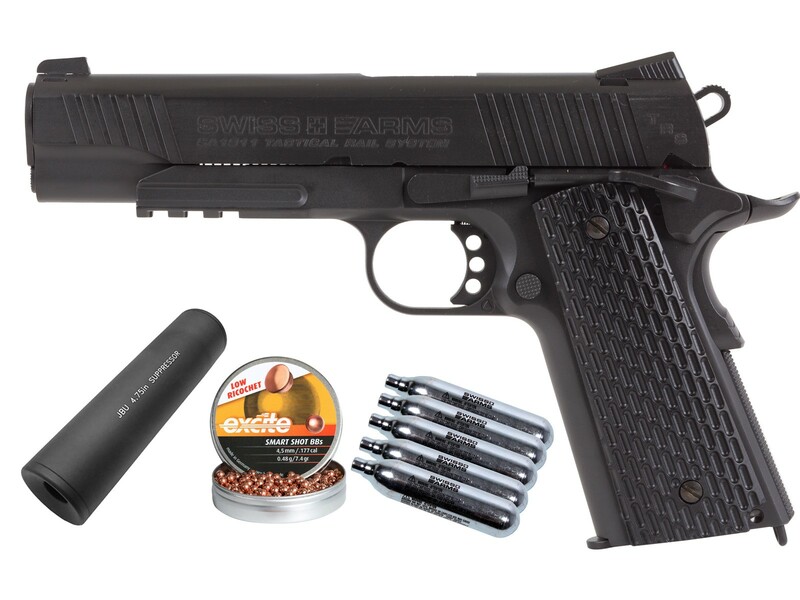 With this action-ready kit, you have everything you need to shoot straight out of the box! Things I liked: Sleek design... 80% blacked out lettering on the slide and barrel... Threaded barrel for aluminum faux silencer... Solid all metal feel. All around nice training piece. Looking at the Swiss Arms weaver rail tac light w/ laser next. Should give it the proper weight to train with. Things I would have changed: Plastic grips... Possibly polymer would have given it the full M1911 tac A1 Taurus feel. Still though... Very comparable. What others should know: If you train or airgun you know how to handle this pistol. Yes, the gun comes with an adapter for the suppressor. what do the sights look like? is it a three dot system or does only the front sight have a white dot? I can t find a front angle of this gun with this faux silencer package showing whether or not the barrel is threaded for the suppressor... Also what color would the adapter be? I have seen orange and black. Which is this? Seems like a great deal... Just worried that the suppressor will need additional parts to work. It is threaded and the adapter that comes with it is black. 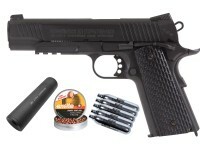 Includes: 12g CO2 Cartridges, 5pk, 150 .177 Cal, 7.4 Grains, Copper Plated Lead BBs, Aluminum Fake Suppressor, 4.75"